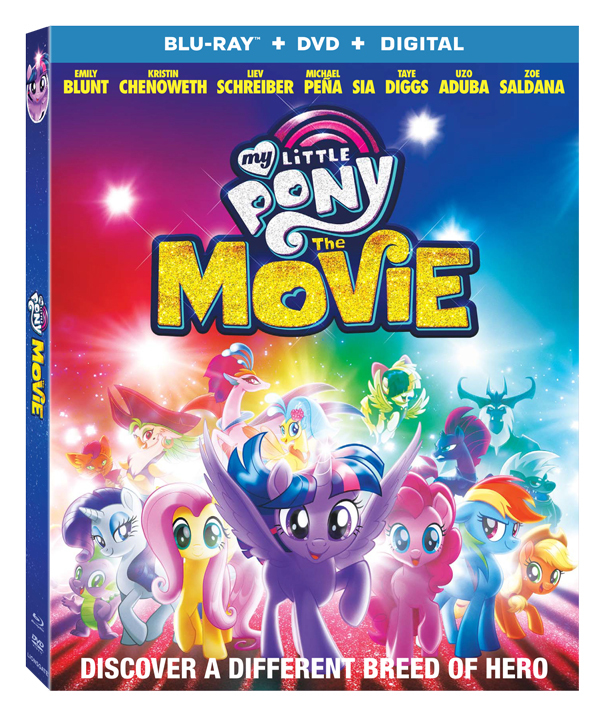 Join the “truly magical adventure” (Mike Reyes, CinemaBlend) of the Mane 6 and their new friends when "My Little Pony: The Movie" comes home on Digital Dec. 19, 2017 and on Blu-ray™ Combo Pack (plus DVD and Digital), DVD, and On Demand January 9, 2018 from Lionsgate. Best friends Twilight Sparkle, Rainbow Dash, Pinkie Pie, Applejack, Fluttershy and Rarity team up in their most epic adventure yet. Directed by “My Little Pony” veteran Jayson Thiessen (“My Little Pony: Friendship Is Magic”) and including original music and songs performed by Sia, Taye Diggs, Zoe Saldana, Kristin Chenoweth and Emily Blunt, "My Little Pony: The Movie" is full of music, fun, and laughter for the whole family. "The My Little Pony: The Movie" Blu-ray and DVD include all-new special features, including a deleted scene, a music video, three featurettes starring the Mane 6, an exclusive Equestria Girls Short and a Hanazuki short, and will be available for the suggested retail price of $29.95 and $39.99, respectively.